At the Center for Biological Diversity Conference Room, Oakland, California. 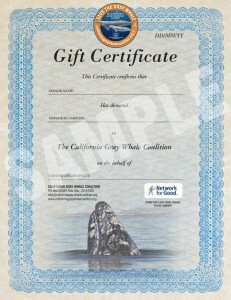 Organised by the California Gray Whale Coalition. The workshop brought together, for the first time, lawyers from the three major public interest law firms for a round table discussion on the major regulatory and policy gaps in the management and impacts of underwater noise in the marine environment. The Coalition kept the workshop small so that good discussion would be possible as so often conferences and workshops have far too many presentations with no opportunity to ask questions or converse. CEO of the California Gray Whale Coalition opened the workshop with a short statement indicating that the incentive for the workshop was the recent Society for Marine Mammalogy meeting in San Francisco in December. Pointing out that the many presentations on ocean noise failed to include major issues such as stress, long term impacts, impacts to prey, to marine ecosystems, reproduction and communication, new technology which will effectively industrialise the oceans, was the driving force in setting up the workshop to address some of these gaps was an important contribution to this critical issue. The failure of the National Marine & Fisheries Service (NMFS) to address these issues was highlighted by the fact that in spite of inviting 27 NMFS scientists and regulators to the workshop, not one representative of NMFS attended. The list of excuses was worthy of media. Ken Balcomb’s presentation was a further reminder of the censorship of noise impacts not only by NMFS but also the Navy. His power-point presentation was particularly powerful as he demonstrated the absolute refusal by both organisations to allow any independent analysis of dead cetaceans which were undoubtedly killed by naval sonar. Professor Arthur Popper, as keynote speaker, contributed a major power-point presentation on the immense lack of knowledge of impacts to fish, crustacea and their importance in terms of ensuring a healthy marine ecosystem. Prof. Popper expressed his concerns that the cetaceans are the main focus on noise impacts when the most important elements of the marine ecosystem are fish, crustacea and marine life on which all life depends. The workshop was also delighted to have Mike Hudson from the Pacific Coast Federation of Fishermen’s Associations as commercial fishermen have been completely ignored by regulators, policy makers and scientific meetings in terms of the impacts on their harvests. As the folks who are out in the water, fishermen are the first people to see the damage as dead and/or limp fish make up the catch. An important point made by all present was the fact that any campaign to raise awareness on the impacts of underwater noise need re-branding as ocean noise pollution – ocean noise – doesn’t inspire or result in any community or political interest of note. As a term, noise pollution doesn’t indicate the injuries and mortality which results. Advertising and/or marketing experts may need to be consulted. Lawyers involved with legal challenges against the Navy spoke of the difficulties in reaching any modification of a five year project on the Pacific North West which will cause Gray whales to migrate through major noise experiments, sonar, explosives, ten times in the next five years. Generally, reaching any worthwhile modification of Navy experiments has not been particularly successful as national security trumps environmental protection. Interpretation of existing legislation by NMFS is selective and has largely ignored the impacts on fisheries. However East Coast Fisheries Management Councils have developed guidelines and policies with respect to off-shore energy and it was suggested that the Pacific Federation make contact with East Coast Councils. Participants were vitally interested in engaging with fishermen and finding ways to dialogue on noise impacts with the potential for joint submissions and lawsuits. Some scientists have suggested that there should be Marine Protected Areas which are completely free of anthropogenic noise. Given the looming elections in November, and the uncertainty surrounding who may be President, almost all potential solutions or actions will have to remain in abeyance until it is clear who wins both Houses. However some recommendations were made including making an approach to the Society for Marine Mammalogy to hold a special meeting on the industrialisation of the oceans. Given the popularity of the noise presentations at the recent meeting, it seems a good opportunity to request the Society follow up with a specialist meeting. Given the sheer complexity of issues which are involved in measuring, managing and ensuring protection of marine species from noise, the Coalition stressed the importance of ensuring that this historic workshop be followed up with more workshops on specific concerns. 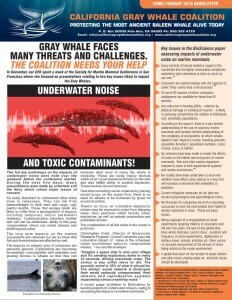 Until such time as the election is over, the most useful outcome will be gathering legal possibilities, defining the most relevant regulatory gaps, identifying the critical gaps in science and finding ways to educate politicians, scientists and the public on the significant threats to healthy oceans which noise represents. The Coalition was deeply disappointed in the response to our appeals for donations to support the workshop and unless there is a recognition that life on earth depends on healthy marine environments, the likelihood of getting proper legislation and protection will remain in the too hard basket. The Coalition has made a start. Now let’s ensure that the journey continues. 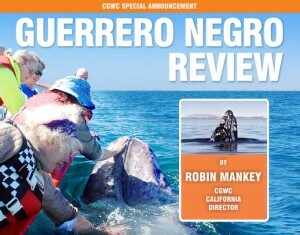 CEO, California Gray Whale Coalition. Associate Dean Graduate School, University of Maryland. Kenneth C. Balcomb, III Executive Director / Principal Investigator Center for Whale Research. Ken is a Charter Member of the Society for Marine Mammalogy. Brettny Hardy Sr. Associate Attorney, Earth Justice. to protect marine species and their habitat. Mike Hudson Board member Pacific Coast Federation of Fishermen’s Associations. David Bain Sno-King Watershed Council, Independent Noise Consultant.